‘The Sunday Game’ talks about how Synovial Fluid Replacement Therapy has worked for him! “This is something that actually works…” Following a course of synovial fluid injections, Pat attributes the vast improvement in his condition to this treatment. 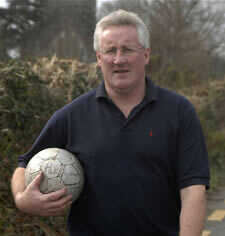 This time last year, Pat Spillane was in constant pain, had difficulty walking and standing and was unable to sleep or to perform his job as a PE teacher. One year on, he has gone from being “a virtual cripple” to being able to lead a normal life again. Although he accepts that he will never jog or run again and still cannot walk or stand for very long periods, he has a much better quality of life with limited pain and much greater mobility and he has returned to work. Pat attributes the vast improvement in his condition to a new therapy called Synovial Fluid Replacement Therapy, which although growing in popularity worldwide, is still relatively unknown in Ireland. Arthritis refers to problems with the joints. There are over a hundred different forms of arthritis and growing. The forms relate to wear and tear of the cartilage such as Osteoarthritis (OA) which is by far the most common. It affects approximately 400,000 people in Ireland. The second most common form of arthritis is Rheumatoid Arthritis (RA) which is associated with inflammation in the joints. In Rheumatoid arthritis the body’s own tissues in the joints are attacked. About 1% of the adult population in Ireland is affected by Rheumatoid arthritis. Ireland has approximately 714,000 arthritis sufferers many of whom are suffering in silence. One in four people in Ireland with osteoarthritis has never seen a doctor as they feel it is part of the ageing process. It’s a big hidden problem. We know that arthritis is a chronic condition causing pain which can greatly impact on people’s lives with half of all patients who develop rheumatoid arthritis developing work disability within 10 years of diagnosis if they do not receive proper patient care. For more information on the purpose of the website please click here.